When working at height one must always take the preventative measures to ensure complete safety at all times when working at height- fail to do so and you leave yourself at risk from serious injury and potentially death. Now who wants that on their site?! If working at height and want to prevent a fall by safely anchoring yourself to an anchor point which when secured there is no risk of a fall as the lanyard connected is shorter than the fall hazard and there for restraining you- this is called Fall Restraint. 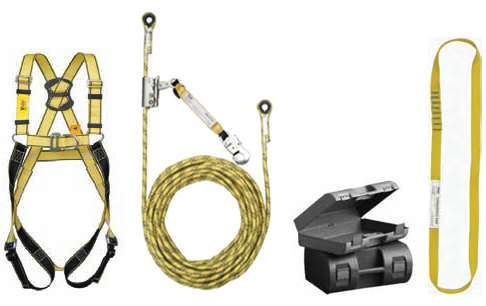 When working at height and there is a constant risk of a fall then Fall Arrest equipment is necessary- this can be in the form of a fall arrest lanyard (lanyard similar to restraint lanyard but features a shock absorber to break the fall) or a Fall Arrest block which is usually a cable or webbing reel that allows one to travel greater distances without having to re-anchor a short lanyard. When a fall is detected by the sensitive units it is broken safely to reduce pressures on the person falling and reduce risk of serious injury. Either of the above methods of Height Safety can be connected to a suitable anchor point such as a height safety eyebolt, beam clamp or trolley. If you have any questions feel free to ask in the comments section.